We are excited to let you know that we appreciate you promotional efforts and have increased our commission rate from 15% to 18%! 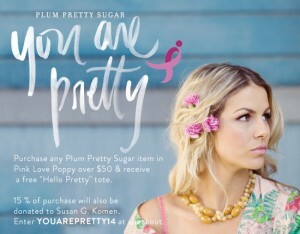 We also wanted to make sure your shoppers were aware of our fun promotion featuring the free “Hello Pretty" tote and a donation to Susan G. Komen in support of Breast Cancer Awareness! We hope you help us support the cause and take advantage of our new 18% commission!